Indy and Mazzy, you make a great collaborative team! I loved your video which taught me a lot about auras and shading and how beautiful artwork is created. Thank you for sharing the tile with each other and your process with all of us! Perfect lesson. Awed and inspired by these two witty lovelies. I would take their class any day. I loved their style, especially Indy!! So good! By the way, what was the name of the tangle? I couldn't hear her. Great CZTs blossoming right in front of us! Such a charming Zentangle lesson - I loved listening and watching these young ones teach. I was so touched by their confidence, knowledge of Zentangle and easy going nature. Your grandchildren really channel your style. Thank you for the inspiring Kitchen Table Tangle video. I agree with you that it is a real pleasure to work with children and I love these moments of creativity with my two girls at home so much. Indy and Mazzy, now how wonderful is that? Magical! Thank you for the video. What I have learned from you is: simply relax, be confident, draw this beautiful tangle, some shading.... Will be trying this tonight. I love the Kitchen Table Series. Always something to learn! Thank you for sharing. Children continually teach me to not sweat the small stuff, spills can be wiped up and you don't have to know what is next, just listen to how you feel. It is going to awesome to see what these fabulous, young artists do with Zentangle over the years!! Aww what sweet girls! They remind me of my daughters when they were younger! It's so nice to see them getting along so well and working towards a wonderful goal of creating this video! They even know the terminology how cute is that! I LOVE it! Thank you very much! How cute are they? Clearly, they are raised in a supportive environment and well-versed in the Zentangle Philosophy. I can hear Molly's words coming out of their mouths! What a priceless gift you have shared with us. Oh my gosh! They did a great job teaching this!!! Thank you Indie and Mazzi! What an inspiring example of teaching at any age. I found it touched me more deeply than some of the other "adult" teachers I have viewed. "Like spreading jelly on toast" kinda perfect! My children are no longer small and I learn from them every single time we are together (usually on the phone). Our journey is amazing! Love the Kitchen Table Tangles. Thank you Maria and Rick. Truly a family affair! Seriously,too cute! Love the sparkle of their imaginations as they create, and their encouragement to the viewer as well as each other. Have shared Zentangle with my grandnieces and so love experiencing their joy and excitement as they create. One in particular is hoping to create her very own original tangle so that she can give others the joy of recreating it. Out of the mouth of babes... and so well done! Indy and Mazzy that was an awesome job that you did, showing us all that tangle. I can't wait to try it out! Parents and grandparents thank you for sharing with us your wonderful thoughtful children and grandchildren. You are blessed! I forgot to add that working with middle school kids and teaching them to tangle I also learn something every time. I often will tangle when I have bits of time while they are working on other projects. I will move from table to table checking in on them and I tangle as I go. I think that it is important that they see me working too. Since I have been doing this it also raises their excitement. They keep asking when do we get to do this. They are so excited to get to do this and also come up sometimes with their own spin on the tangles. That is really fun to watch. Thank you Indy and Mazzy...you reminded me...to smile...and just do it...no worries...everything does work out perfectly. I think what my nephews have taught me is to be quiet and listen. I have had the best times just listening to them work through things or entertain themselves. That glimpse into their minds is so precious. The best is driving them somewhere when they play, talk or sing. I loved watching and hearing your granddaughters create such a wonderful tile! When tangling with kids, I find that they usually don't have the inhibitions that adults do, and are more likely to jump right in and start tangling! What a wonderful idea for a class, to have people each start a tile and then pass the tiles around! What a treasure!!! Thank you Indy and Mazzy. 😃 I've learned from my 7 year old granddaughter to do some art every day, eat snacks, read all I can and wake up happy. I am in awe of these two rays of sunshine - so competent in both tangling and instructing! I love their style. They are a joy to learn from. What a wonderful trip with you Indy and Mazzy! WOW! So well done. It's great to see such confidence. They did a wonderful job of sharing. Great video! Enjoy. It is true, you learn from your children. Also true......they grow up too fast! This video is awesome. Good for you! What I have learned is that appreciation and encouragement is a gift, it's free and the receiver and the giver both gain from the giving. That the smallest achievement is never small. All achievements are exalting, especially when met with a smile and positive feedback. My granddaughter thinks drawing a zigzag and a circle is a masterpiece and I have to agree completely. I love the smile and enthusiastic response I receive when I tell her what a wonderful piece of art she has created. The amazing thing is that this doesn't just work on children, if you could treat everyone in your life with the same appreciation and encouragement then your gifts would be exponentially multiplied. And don't forget to give to yourself as well. To Indy and Mazzy, thank you for a wonderful lesson. Oh my goodness! I remember meeting Indy during CZT #4 when she was just a baby. They're both adorable. What a wonderful post and written with so much love. Thank you Molly, it was so nice of you to write "all children are amazing". Your daughters did a great job, I really enjoyed and I agree, they can learn from us, but we, parents can learn from them also. My son( 35 years) had a very serious caraccident about 5 years ago. He had a long revalidation and he will never been the same as before but he accepted that. He can live on his own and works part time and he is happy again. He is satisfied because he is still. I'm grateful and we have now a better relation than before the accident. We have learned to live in the moment and the Zentanglemethod helped me a lot. Great video - quite the little experts! It's great how they clearly love the process of Zentangle and are not attached to the outcome - I think I place too much emphasis on getting it 'right' and forget to just go with the flow and enjoy the process, so thank you girls for reminding me of this important lesson! We do indeed learn from our children. I have to admit I had tears in my eyes as I watched this video. The purity of their hearts and the simplicity of their instructions were so beautiful. And such self-confidence and presence. I could hear Molly's voice and instructions coming through them. Are they not pure grace and gift? My daughter is in college....makes me miss her even more than I always do. Tangling with kids is the best! Indy and Mazzy did an awesome job of team-teaching. I tangle with my first grade class, and I just love to listen to their commentary as they work...they are so completely in the moment. I'm a family therapist and have shared zentangles with several of the kids I work with. The thing that keeps striking me is how very individual they are and how quickly they make the ZT method their own, feeling no constraints to do it the way I showed them. "Problem kids" feeling perfectly free to just be themselves and express themselves in their own way is a beautiful sight to see. What I have learned from my children is to hold things loosely and don't set too high of expectations! Also learned that failure is inevitable at times but it doesn't define you. Beauty is often hidden in mistakes. Thank you! Wow! Molly both girls did amazingly well and their self confidence at their age is rare but a very precious gift that will benefit them going foreward in life. Indy is a chip off the old block just like her mom! I could even see the style in her voice and how she explains what she is doing to that of your very own style. When i see kids do things like this beyond my expectations it blows me (more like overwhelms me with happiness and brings tears of joy - this was no exception). 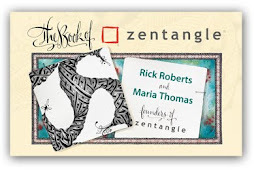 Zentangle continues to bring the best out of people young and old both students and teachers. It has helped me creatively but also professionally and emotionally beyond what i ever imagined! Thank you Rick Maria Molly Nd the rest of the team for sharing this gift with us. Sincerely , Matt Wieczkowski (mattski1208). I loved this video - it was so much fun! Well done Indy and Mazzie - you make a great team and are both excellent teachers! Hi girls! What a pleasure watching your first video! I am often asked when children can start tangling. You just showed me that even at the age of 5 and 7 you can be able even to teach Zentangle!I am not only impressed how you show us tangling your tile but also how you hold your pecil and tortillon, so professional! Now I can tell everybody from you little girls so far away from Bavaria, Germany, that anything is possible, one stroke at a time - no matter of age! I love this video! It shows how free of judgments these two little girls are as they encourage each other in the creative process and produce this beautiful piece of art! Delightful! A great lesson to not criticize ourselves in our creative endeavors and just keep working toward the end and see the beauty develop. Thank you for sharing this encouraging video. My 8 year old daughter is a great inspiration for me. Past one year she has made me tangle almost each and every day. When I lose short of ideas or anything she will just fill my head with something stunning. Today what she said was so charming. 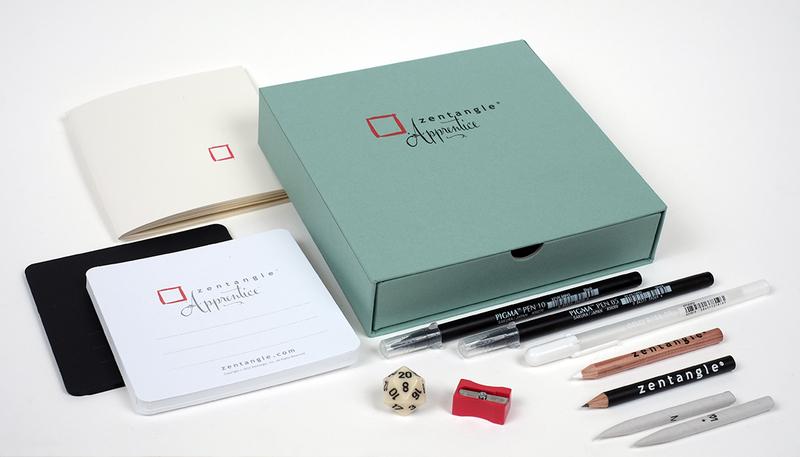 I had just finished all my work and started to tangle on my tile, supported by a thick flattened cardboard placed on my lap. She had her other studies to do, but wasn't in mood. So she playfully started kicking me lightly, and I was having hard time keeping my lines steady. And I told her to stop doing that, as it will ruin my drawing. She immediately snapped at me "Mom, in Zentangle there are no mistakes. You are getting an opportunity to create something new.".... Very very witty n quick reply from her. But The Truth. Her reply brought back the smile ☺ I had lost on my way to perfect the tangle. I soooo love her. I think the best thing I my children ever taught me was their absolute faith in me in a way I never had in myself until I saw it in their eyes. I remember when my daughter was a toddler she thought I was magical in my abilities. I was both touched and tickled in her faith in me and though I did not fully believe what she did at the time, she did plant the seed. Children are honest and often see important truths that we as adults have dismissed as foolish. It's taken many years to see the truth of my capabilities as shown to me through my children's eyes but I might likely never had if not for the faith and trust in me that my children had. Oh my, the girls are so sweet and so clever! I love how they are creating this project together as a teamwork. Obviously they have been watching the adults several times while tangling and teaching ;-). I love this video and I love Mollys comment about what we can learn from children. Thank you for this lesson!! Just watched this Kitchen Tangles video and those two little artists are so very precious. They knew exactly what they were doing and came across as very knowledgeable. I must say that I learned a lot by listening to them. They were relaxed and just kept following what they had their minds set on. I have two granddaughters aged 6 and 8 who have just seen some of my tiles and want to learn to draw "like Gramma Leslie". So when school is out for the summer, I hope to be able to have them over a few times so we can all learn together. It would be so special because they are the only ones of my 5 granddaughters that I see very often and it isn't often enough! Maybe if we had classes, they would be more inclined to come over more often. Thank you for this video, it was such a treasure. I'm always happy when you post them on the blog because I don't have an Android device or an Apple device to sign up to the app. Hopefully, by the end of the year, I can have something along those lines. As always, thank you Zentangle, for your inspiration and knowledge! I love how deliberate they are with their drawing. And they definitely know the value of using auras on a tile. Precious. I am in awe. What a great tutorial. I will be using your tangle in my work. I also thank you for the clear display of shading and use of the tortilion. I've never felt comfortable using them and now I will try. You gals did a great job and I'm sure you will continue to hone your skills. Thanks for sharing. Great job Indy & Mazzy! May daughter told me she will be doing a Zentangle section in her art class at school after April vacation break. She is so excited! She has tried to do a couple with me recently. I picked up another book for her to browse through and get a head start this week during vacation. Indy and Mazzy, thank you for sharing your sweet tangle with us. I often teach children and am anxious to teach them your tangle too.